Samantha Cameron was moved to tears today as her husband David spoke about their disabled son Ivan who died at the age of six. In a moving section of his leader’s speech to the Conservative party conference, Mr Cameron reflected on how he felt when pushing his son in his wheelchair. The Prime Minister’s voice cracked as he revealed his hope that society’s attitude to disability had changed since the Paralympics, and Mrs Cameron was seen welling up in the audience in Birmingham’s Symphony Hall. Large sections of Mr Cameron’s speech were deeply personal, and left him open to the charge of using sympathy to win votes. The PM repeatedly referred to his upbringing, attending a ‘posh’ school and his father’s disability. Striking an upbeat tone, he declared an ambition to create an ‘aspiration nation’ through hard work. And he took aim at Labour’s ‘class war’ saying Tories ‘just get behind people who want to get on in life’. Mr Cameron hailed the Paralympics as a key event in helping to prove Britain is ‘the best country in the world’. And he said he hoped the huge public attention which the Games attracted would have a lasting legacy in altering the way people with disabilities are viewed. TV cameras caught Mrs Cameron sitting in the auditorium with tears in her eyes. Ivan, who had cerebral palsy and epilepsy, died aged six in 2009. The main theme of the speech was a rallying cry to people who ‘strive to make a better life for themselves’ as Mr Cameron sought to recast the Tories as not the party of the better off but ‘the party of the want to be better-off’. He went on: ‘To all those people who say: he wants children to have the kind of education he had at his posh school. I say: yes – you’re absolutely right. Mr Cameron’s voice also appeared to crack when he spoke of his father, Ian, who died in 2010. ‘I don’t have a hard luck story. My dad was a stockbroker from Berkshire,’ he said as his voice cracked. 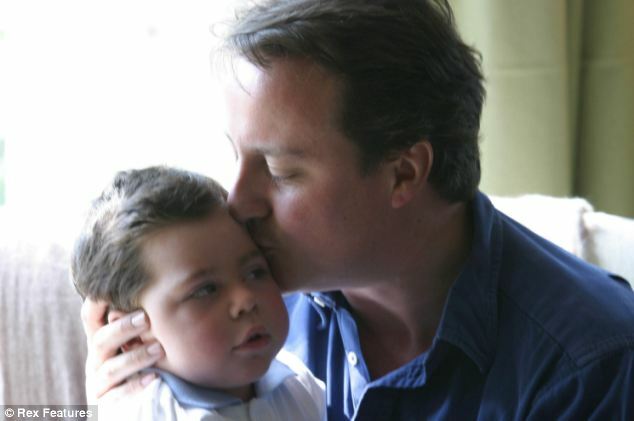 Mr Cameron added: ‘He was born with no heels on his feet and legs about a foot shorter than they’re meant to be. But he never complained – even when he lost both those legs later in life. He used the speech in Birmingham to set the battleground for the next election, putting welfare, education and economic reforms at the centre of the Tories’ pitch for an overall majority at the next election. He said: ‘Let us here in this hall, here in this government, together in this country make this pledge – let’s build an aspiration nation. Let’s get Britain on the rise. ‘Deficit, paid down. Tough decisions, taken. Growth, fired up. Aspiration, backed all the way. He also revived his pitch of ‘compassionate Conservationism’, arguing his party had to represent everyone in Britain. ‘My mission from the day I became leader was to .. show the Conservative party is for everyone: North or South, black or white, straight or gay. ‘But above all – to show that Conservative methods are not just the way we grow a strong economy, but the way we build a big society. And he defied critics of his decision to protect foreign aid from cuts, telling the Conservative party they should be ‘proud’ to have helped to vaccinate 130,000 children around the world. On tax, Mr Cameron accused Labour leader Ed Miliband of thinking all workers’ income belongs to the state who lets them keep some of it thought tax cuts. Mr Cameron has often paid tribute to the Paralympics for its power in changing social attitudes. He added: ‘I was trying to think of my favourite moment. Was it telling President Hollande that no, we hadn’t cheated at the cycling, we didn’t have rounder wheels, it was just that we peddled faster than the French? ‘No… for me it was seeing that young woman who swam her heart out for years, nine training sessions a week, two hours a time.